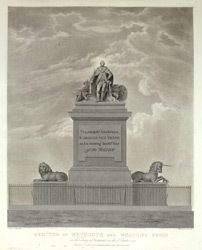 Print of a monument to George III erected by grateful inhabitants of Weymouth at the south end of the esplanade. Between 1789, the summer of the King's first visit here and his last in 1805, Weymouth enjoyed the social cachet as the most favoured sea bathing resort of the Royal Family. New visitors were attracted to the town and many fine new buildings sprung up. This monument was erected in 1809 and was designed by architect J. Hamilton. It was of Coade stone, a good quality and very realistic artificial stone made at the Coade Stone Manufactory in Lambeth, run by Mrs Eleanor Coade and John Sealy. (Coade was favoured by George III and used at St George's Chapel and Buckingham Palace.) The King is displayed here in ceremonial robes with sceptre and crown. However the royal figure is dwarfed by the huge pedestal he is standing on with inscription. The print is engraved but has an aquatinted background.